This recipe is from my cousin, Christy. 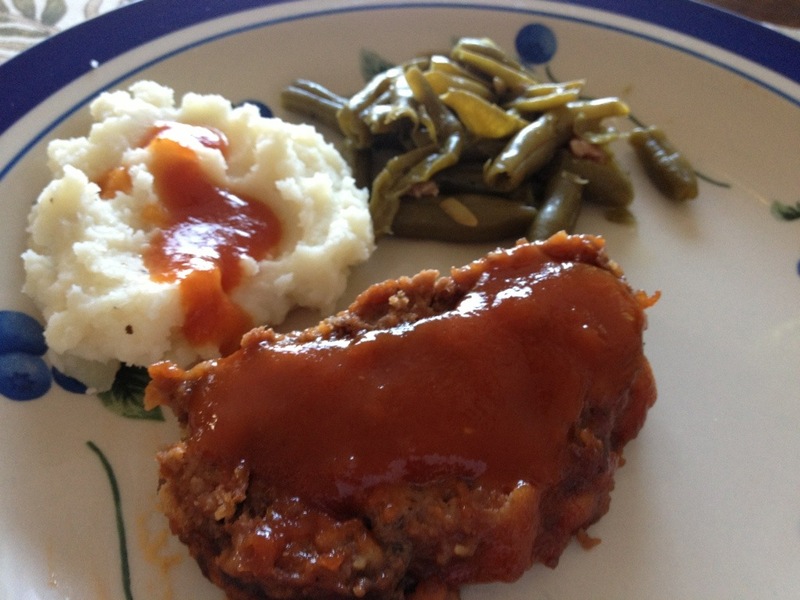 It has made meatloaf lovers out of many folks who didn’t think they could like meatloaf. I didn’t originally consider it a. “Skinny” recipe, but if i make it into a long, thinner loaf, it easily makes 10 slices of very nutritionally reasonable meatloaf. If you’re looking for a different sort of meatloaf altogether, check out my meatloaf muffins! 1. Mix beef, crackers, eggs, salt, pepper, and half of tomato sauce thoroughly. 2. Form beef mixture into a long, narrow loaf stretching the length of a 9×13 pan. 3. In a small saucepan, mix remaining sauce with mustard, sugar, ketchup, water, and vinegar. Cook on low until sauce begins to thicken. 4. 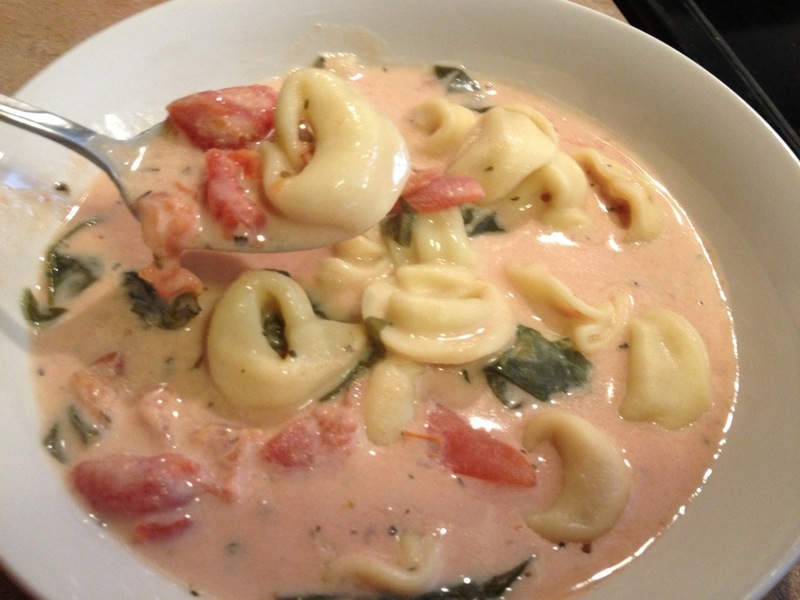 Pour a little over half of sauce over loaf. Reserve remaining sauce in pan. 5. Cover loaf with foil and bake at 350 for 1 hour and 15-30 min or until center is done. Scoop sauce from sides, and pour back over top of loaf about every 20 min. 6. Just before serving, cook reserved sauce down until thickened. Serve over slices of meatloaf. 1. In a large bowl, mix together the ground beef, egg, bread crumbs, pepper, salt, onion powder, garlic powder, and Worcestershire sauce. Form into 5 balls, and flatten into patties. 2. Heat the oil in a large skillet over medium heat. Fry the patties in the oil until patties are nicely browned,and cooked through, about 4 minutes per side. Remove the beef patties to a plate, and cover with foil. 3. Add onions, and 2 tbsp water to pan, Cook onions until they begin to soften. 4. Sprinkle flour over the onions, and stir with a fork, scraping bits of beef off of the bottom of the pan as you stir. Gradually mix in the onion soup and sherry. 5. Add mushrooms and 1/4 cup of water. Stir in seasoned salt. 6. Simmer and stir over medium-low heat for about 5 minutes or until mushrooms reach desired doneness. 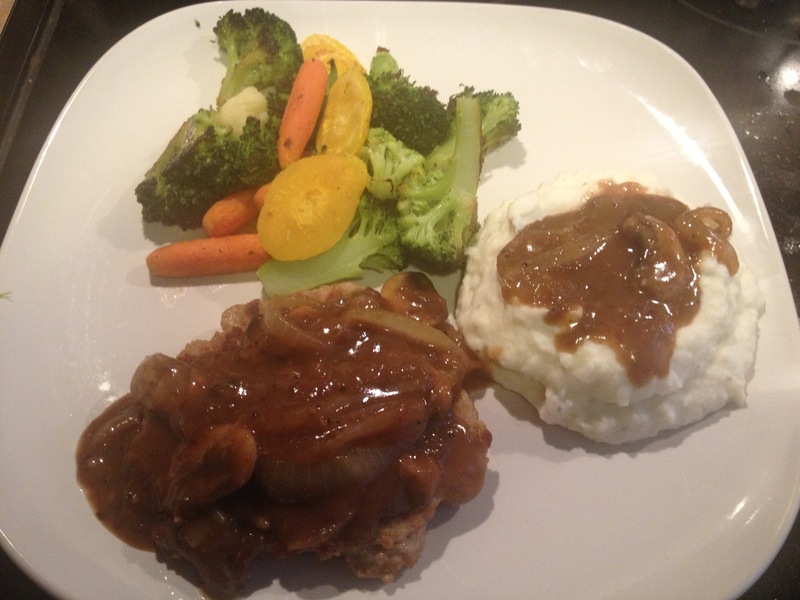 If gravy becomes too thick, add 1 tablespoon water at a time until the gravy is desired consistency. 7. Serve patties covered with gravy. Also great over mashed potatoes. This recipe requires about 45 minutes, which is a luxury I don’t often have with our busy schedule. If you have all the time in the world…continue on. I prefer the results of the “slow cook” method. However, If you’re interested in speeding this up, you can use a ziplock steamer bag, and cook your potatoes 1/2 of the time listed on the bag. Then toss in olive oil and bake for only about 15-20 min. 1. Cut potatoes into cubes, no more than 1 inch wide. 2. Place potatoes, and olive oil in a large ziplock bag. Add salt, pepper, and garlic powder, and shake until all potatoes are lightly oiled. 3. Spray a flat baking sheet liberally with nonstick spray, and spread potatoes in a single layer on pan. 4. Cover pan with aluminum foil, making sure all corners are tucked under to create a seal. 5. Bake at 425 for 25 minutes. Uncover, turn potatoes, and bake another 10-15 minutes. This is inspired by the Napa Chicken at Applebees. It’s pretty tasty, and the whole meal (this and the roasted potatoes) together is less than 500 Calories. 1. Season chicken with salt, pepper, and paprika on both sides. Grill chicken breasts on medium heat until cooked through. You could also bake them i the weather is bad, but I like them grilled. 2. While chicken is grilling, melt butter in a large skillet. Sautee onions until about halfway done. Add mushrooms and stir until mushrooms begin to soften. Add 1/2 cup red wine to skillet, and cook mixture, stirring occasionally, until wine has reduced to just a few tablespoons of liquid. 3. 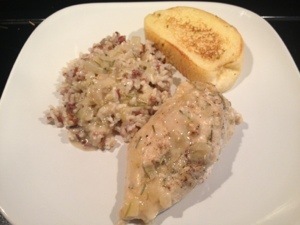 Divide onion and mushroom mixture evenly between 3 plates, and place a chicken breast on top of onions. Pour any remaining “sauce” in the pan over the chicken. 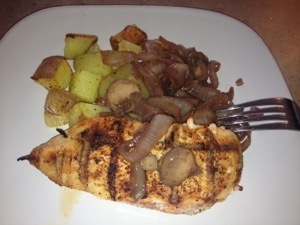 I serve this with roasted potatoes, just like Applebees does, and altogether the whole meal is less than 500 Calories. Enjoy. 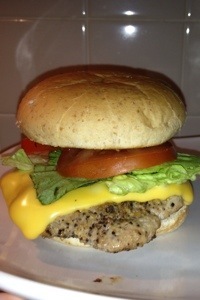 So, a while back I posted a link to my buffalo turkey burger, which was really good. But, sometimes you just want a more classic burger. So Here it is. I used a trick my best friend taught me, and added some A1 to the meat for great flavor. Also, I use a steak seasoning that is the “Kroger” grocery store brand. You could probably use McCormick montreal steak grilling seasoning. 1. Mix all ingredients, except for steak seasoning, together until well combined. 2. Roll out about 16 inches of plastic wrap, and divide meat into 4 even balls. Space evenly across plastic wrap. 3. Place another sheet of plastic wrap on top of meat, and smush each ball into a patty, between the sheets of plastic wrap. 4. Remove top sheet of plastic wrap, and sprinkle 1 tsp of steak seasoning on top sides of the patties. 5. Recover patties, flip over, and repeat step 4 with the back sides of the patties. 6. Cook patties in a skillet, or on the grill. About 4-5 min on each side, or until center reaches 165. This was really yummy. I served with mixed grains, and poured the sauce over the grains. Definite repeat. 1. Salt and pepper your chicken breasts, then sautéed them in a skillet, using butter flavored nonstick spray. 2. 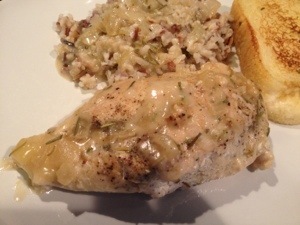 Remove chicken and place it in a baking pan (9×9 would work) sprayed with nonstick spray. 3. Spray same skillet again with spray and sautéed onions and garlic until softened. If you need to you can add 1-2 tbsp of water to keep onions from burning. 4. Stir four into onions and slowly add broth, stirring until smooth, then stir in milk slowly. 5. Bring to a simmer, and then cook on low heat about 2 minutes, stirring constantly until sauce thickens. 6. Pour sauce over chicken. Cover pan with foil and bake at 350 for 25-30 min.